Altaf Hussain, the exiled leader of Pakistan's powerful MQM party, has been released on bail by police in London after being arrested on suspicion of money laundering. The 60-year-old was questioned for seven hours on Friday evening. He had been transferred to hospital for check-ups after being arrested on Tuesday. Investigations are continuing into the case, and Mr Hussain is due to report to police again in July. The police say Mr Hussain's move back from hospital to detention earlier on Friday was agreed after consultation with Wellington Hospital, where he had been receiving treatment. 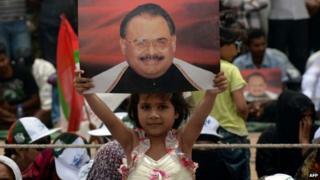 Thousands of his supporters have been staging a protest rally in Karachi - Pakistan's biggest city and the MQM's power base. The news of Mr Hussain's release prompted wild celebrations in in the city, reports say. The British and Pakistani authorities have in the past expressed concerns that any arrest of Altaf Hussain could lead to violent protests. Mr Hussain has lived in the UK since the early 1990s, saying his life would be at risk if he returned to Pakistan. He has since become a British citizen. Born in Karachi in 1953 to a middle-class family; studied pharmacy at university. Formed MQM party in 1984 to represent Mohajirs - descendants of Urdu-speaking Muslims who migrated from India to Pakistan. Requested political asylum in UK in 1992, later gained British citizenship; continues to run MQM from north London. Mr Hussain, his party, as well as some of his associates and relatives are currently the subject of a number of British investigations. One is looking into the question of whether he has incited violence in Pakistan in his televised speeches. Mr Hussain denies the accusation. Another is into whether the MQM has paid its UK taxes correctly. The most high-profile investigation followed the 2010 murder in London of senior MQM leader Imran Farooq. No-one has been formally charged with his killing. The MQM is often accused of extorting money from businesses in Karachi and shipping the money to the UK.